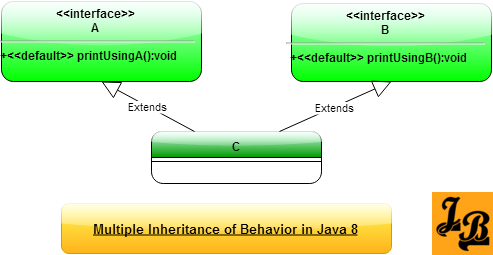 This article explains how default methods enable multiple inheritance of behavior in Java 8 using the new default methods feature in Interfaces. Click to Read Default Methods tutorial implemented in them, it is now possible to have a derived class inherit methods from multiple parent interfaces. So, multiple inheritance of behavior is now possible. A is an interface with a default implemented method printUsingA(). B is an interface with a default implemented method printUsingB(). C is a concrete class implementing both A and B interfaces. In the main() method of C an instance of C called cObj is created. Methods printUsingA() & printUsingB() are invoked on cObj. Multiple inheritance of behavior is thus achieved as C inherits 2 implemented methods(or behaviors from A & B). We just saw above how C inherits implemented default methods from interfaces A & B. The two inherited methods had different names so there was no confusion. But what if the default methods being inherited had the same signatures – same name and same return types. Java 8 provides resolution rules for this. I have covered conflict resolution rules for such scenarios and the classic diamond problem resolution in my next article which you can read hereRead tutorial on Java 8 multiple inheritance conflict resolution and diamond problem.